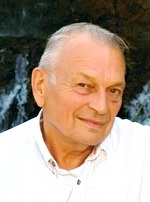 Dwayne Loren Menke, 84, of Gardner, KS passed away Easter morning to be with his Lord and Savior. Funeral Service will be 10:00 am Thursday, March 31, 2016 at First Baptist Church, 324 E. Shawnee, Gardner, KS 66030. Visitation 6 – 8:00 pm Wednesday, March 30, 2016 at Bruce Funeral Home, 106 S. Center, Gardner, 913-856-7111. Graveside service with Military Honors will be 10:30 am Friday, April 1, 2016 at Shell Creek Baptist Cemetery, 33981 205th Ave. Columbus, NE. Memorial contributions may be made to the First Baptist Church, Gardner. Nebraska arrangements will be handled by Gass-Haney Funeral Home, Columbus, NE 402-564-5227. Dwayne was born January 30, 1932 in Columbus, NE to William John and Ida Mae (Schwanke) Menke. He spent his youth working on the farm with his four sisters and younger brother and graduated from Columbus High School in 1950. Dwayne married Genevieve A. Johnson July 19, 1957 in Stromsburg, NE. He joined the Navy after high school, served as an airplane mechanic and retired as a Chief Petty Officer after 27 years of active duty service. Dwayne was a devout follower of Jesus Christ, demonstrating his faith through community service. In the church, he served as a deacon, trustee, Sunday School Teacher and was known to the kids in church as “Mr. Gum Man”. He will be remembered as a faithful husband, steadfast father, loyal brother, devoted grandfather, enduring friend and will be greatly missed by all. Dwayne is survived by his wife Genevieve of the home; daughter, Rosemary Menke of Cincinnati, OH; sons, Dave Menke and wife Teri of Chandler, AZ, Tim Menke and wife Heidi of Dayton, OH and Steve Menke and wife Kendra of Olathe, KS; five grandchildren: Jill Menke Norman, Ashley Menke, Kennedy Menke, Jack Menke and Tom Menke; one recent first great-grandchild, Hunter Norman; sisters: Marcella Hauser of Grand Island, NE, Vernice Voight, Luella Luchsinger both of Columbus, NE, Ruthie Durkop of Humphrey, NE and brother, George Menke of Columbus, NE.